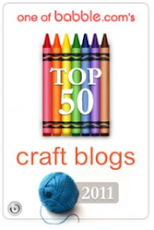 The Creative Place: Bloggers Quilt Festival! So I normally don't post on the weekends, but I found this fabulous online "Bloggers Quilt Festival" and wanted to join in :) There are so many fabulously talented quilters out there! Wow! I haven't made that many quilts (about 4, I think) but have definitely been eyeing quilting as a new project. 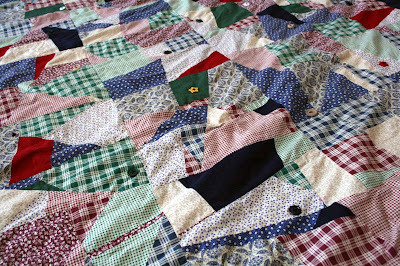 Below is a quilt that has a lot of sentimental value and has had lots of use and love :) I started making it shortly after I met my (now) husband, about 7 years ago. I was making it for his birthday even though I barely knew him :) I knew there was something special about him and wanted to make this for him. 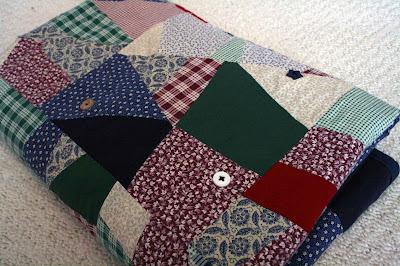 It's a simple crazy quilt, with fun buttons sewn on. 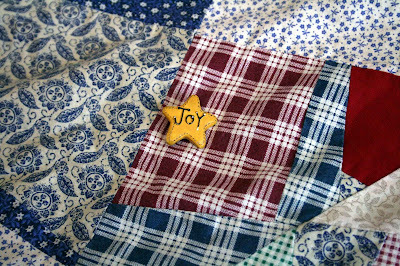 I got two buttons that have "Joy" on them and sewed them on the top and bottom part of the quilt where it would always fall over the heart of whoever was using it. Thus, "Joy in my heart" :). This quilt is now a family favorite for me, my husband, our precious 2 year old son and our miniature schnauzer, Mr. Biz. I love it! I have not does a crazy quilt before but I just might have to now. I love that you made such a wonderful gift before you even knew he'd be a part of your life. You did a great job! Very pretty! I really like that crazy quilt. I am collecting some fabrics for a crazy quilt. I hope I will actually make it one of these days. Great crazy quilt. The buttons are great, and add a special touch. Never made a crazy quilt, yours is excellent. wonderful. What a great quilt. Great quilt and a great story. You made a wonderful quilt that was a gift meant to bring the user joy and it booneranged. That is a very comfy looking quilt. Nice job. 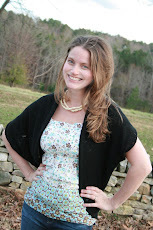 Crazy quilts should be called fun quilts...waste not quilts...wow quilts! But they of course are crazy and speak of the pulling together and making beautiful that life often requires, nice job, nice story. I have been slow to get all the entires in the festival, before she has another one, but I am trying!